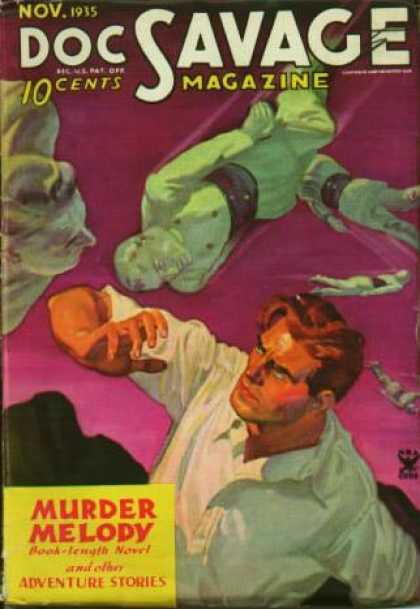 Today I thought we’d take a quick look at the Hero Pulps; specifically, the triumvirate of great pulp heroes, Doc Savage, The Shadow, and The Spider. 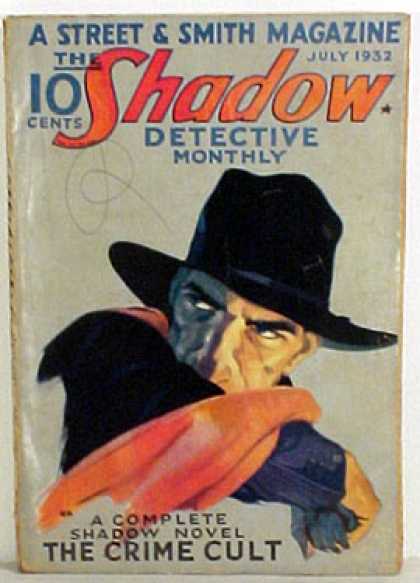 The Shadow may be arguably the most popular of the three, but my favorite is Doc Savage, and he’s the one whom I’m most familiar with, having read well over a hundred of the one hundred and eighty one adventures chronicled in his magazine run (1933 – 1949). The vast majority of the Savage novels were written by Lester Dent under the Kenneth Robeson house name. The creators of Superman borrowed liberally from Doc’s saga when they created their iconic comic book character (just to name a few similarities, both had a “Fortress of Solitude” at the North Pole; Doc was “The Man of Bronze,” Superman “The Man of Steel;” both were named Clark). Savage is usually depicted on his covers (especially earlier in the run) in close up and rather more clothed than on the covers of the Bantam paperback reprints. 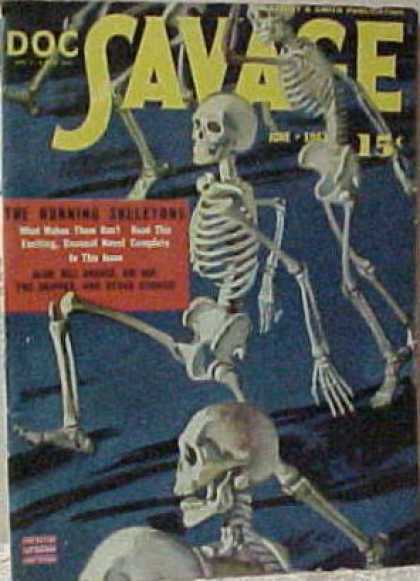 Most of the early PB covers were done by the great Jim Bama, and, frankly, they largely outshine the pulp covers which, while technically proficient, are somewhat repetitous. If this was “Paperback Cover Friday,” I might show some of them. Perhaps at a future date. The character of the Shadow has a genesis too complicated to recount here. 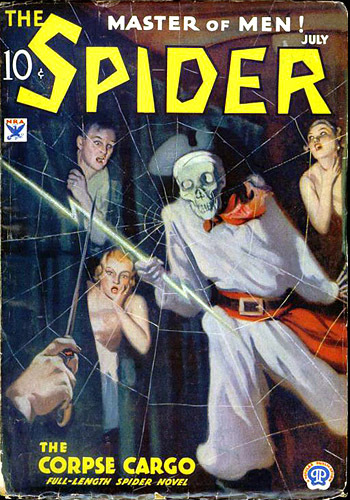 Walter Gibson (under the Maxwell Grant house name) created the “pulp” version, and wrote 282 of the 325 stories (1931 – 1949). 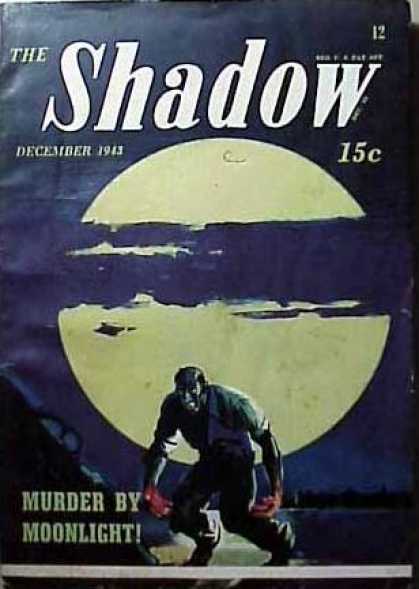 Although a close-up of the Shadow himself was a cover standby, there were actually many interesting and evocative Shadow covers, so I’ve picked a few for you to check out. 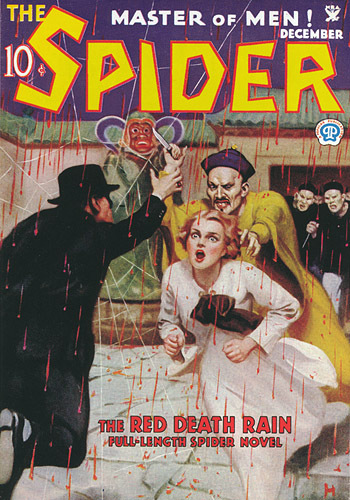 The Spider started out as kind of a typical pulp vigilante, but when Norvell Page took over most of the writing (under the house name of Grant Stockbridge), he boarded the crazy train and rode it until the end of his magazine run (118 issues between 1933 and 1943). 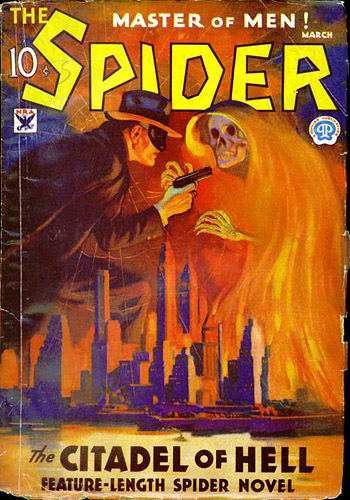 If you like your pulp action hot and savage, where, say, the entire population of Cincinnati or maybe 40,000 Manhattanites might perish in a single adventure, the Spider is the pulp for you. Wide-spread bloodshed is delivered by weapons of mass destruction or personally at the hands of the Spider via his barking automatics. Also, check out the titles of the novels. Pulpy stuff, indeed, distilled to its purple-ist essence. 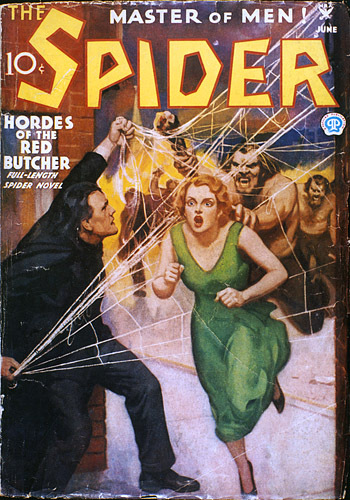 These were the most popular of the Hero Pulps, but there were many others, especially if you include their antitheses, the Villian Pulps. Some, like The Avenger, lasted for twenty or so issues. Some, like The Octopus, lasted only one. Drop a comment if you’d be interested in seeing some of these covers in a future Pulp Cover Friday.